Ryo Central: The Full Price Freemium Rip Off is Here! The Full Price Freemium Rip Off is Here! A strange thing that probably made people laugh some years ago. You buy an expensive game, and to get improvements quicker to play the game with joy, you have to buy another full price range offer. Yearly. Freemium. Well known in the smartphone space. You download an app for free and you can enable more features by buying stuff, or the full license inside the game. But without recognizing, another kind of this sneaked in to our gaming consoles and PCs. The full price freemiums. 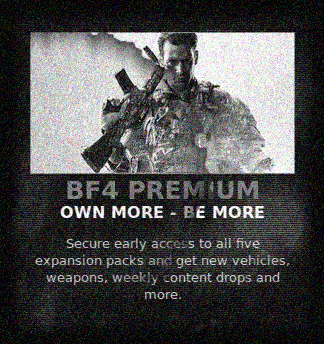 You pay like 50-70 bucks for a game, which is okay for big titles like "Battlefield 4" or "Call of Duty: Ghosts". But then you will see, if you pay another 49 bucks per year, you'll get bettrer weapons, faster upgrades, and special items. I think this is a very sad development in the gaming scene. And it disrupts game play very well. If you can, or want, to spend nearly double the price you get unfair advantages, while for the other in the game, the experience is pretty much ruined. Skill to buy. If the game was free, this would be really good, but if you pay insane prices, you want the full game. Everything. It's just another way to try to squeeze out as much money as possible out of the gamers. And yes, not that the games are bad. They are very tempting. Especially if you get shot by noobs with special weapons. And besides, especially on the military shooter games, can you imagine you have to buy upgrades in the Army yourself only to get a special equipment to fight a war?